The trio joined Larry, the Sheriff, Nadine and the gang on RFD-TV's Larry's Country Diner to bring you this live and unplugged collection of their top hits. 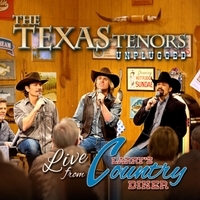 Having received the first standing ovation from the studio audience in the over 100 episode history of the Larry's Country Diner, The Texas Tenors, courtesy of Larry Black, decided to release this collection of unplugged hits they sang live in the studio that February 2013 morning. Joined by world renowned keyboard artist Tim Lee and award winning country music legend Jimmy Caps on guitar, this stripped down collection lets the trio's harmonies and smooth vocals shine through in every measure.